Before we get into the local derby pre-season friendly game between Cheshunt and Enfield Town last night I must mention the travelling fans who turned up in numbers and made lots of noise to back their team - Yes I know it was only just up the A10 but when you compare the above pictures from pre-season games you can see that The Towners have gained fans and it's a good indication many people are turning to the non-league game for value for money and enjoyable football. 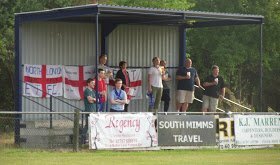 For those not in the know The Towners lost manager Bradley Quinton at the end of last season who took with him a large amount of the squad he had assembled at Donkey Lane to Vanarama South side Braintree Town. Of last season's squad only Micky Parcell started the game at Theobalds Lane as the other player who stayed in fan's favourite Mark Kirby is still unavailable at present. 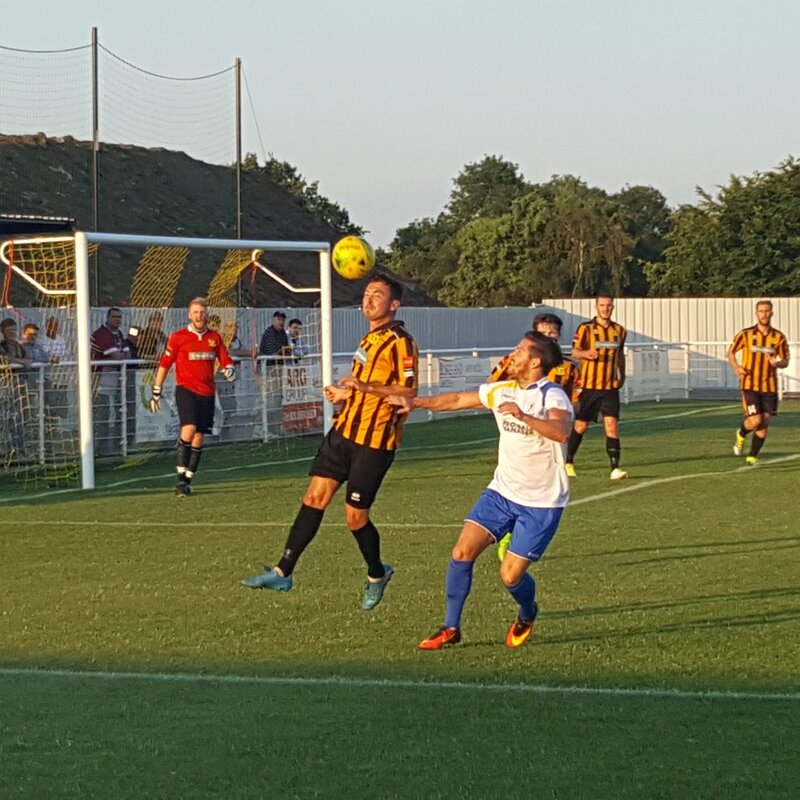 The Ambers featured ex Towner's Dave Kendall and Ryan Doyle in their starting XI with Liam Hope on the bench. 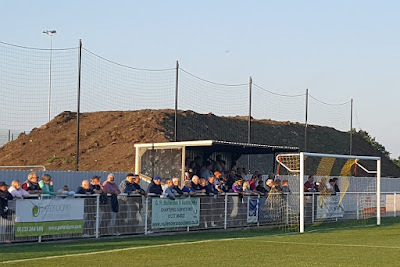 The home did look good in patches going forward but it was Enfield Town who impressed and they were much the better side - new manager Andy Leese and his management team deserve a massive amount of credit to put together such a good team in only a few weeks. Of course he will know this is just a pre-season friendly but to score EIGHT goals will give him and the team much confidence going into the last few warm up games and into the season proper. After only four minutes Drew Roberts opening the scoring with a neat finish inside the box after a dummy left him in space. It was 0-2 when Ralston Gabriel broke free of the home side's high defensive line to calmly pass the ball into the back of the net and away from their keeper. Roberts got a second just prior to half time to make it 0-3. It was 0-4 just after half-time when Mario Noto scored an absolute screamer of a goal - The ball was laid back to him outside the box and he smashed the ball first time with a rocket of a shot that the keeper stood no chance of saving. The goals rained in from then when Sam Youngs, Simon Thomas, John Kyriacou and Jack Higgs all netted. 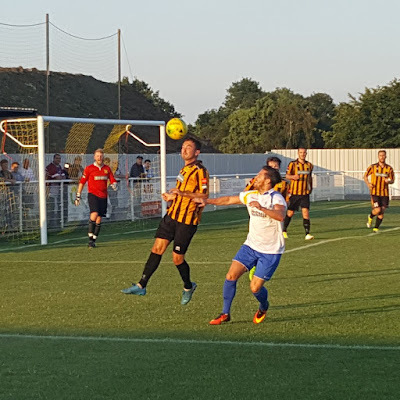 John Kyriacou's goal was equally as good as the one scored by Noto and reminsicant of David Beckham's famous goal for Manchester United against Wimbledon - seeing the keeper off the line he launched a high looping shot from inside his own half from right-back position. 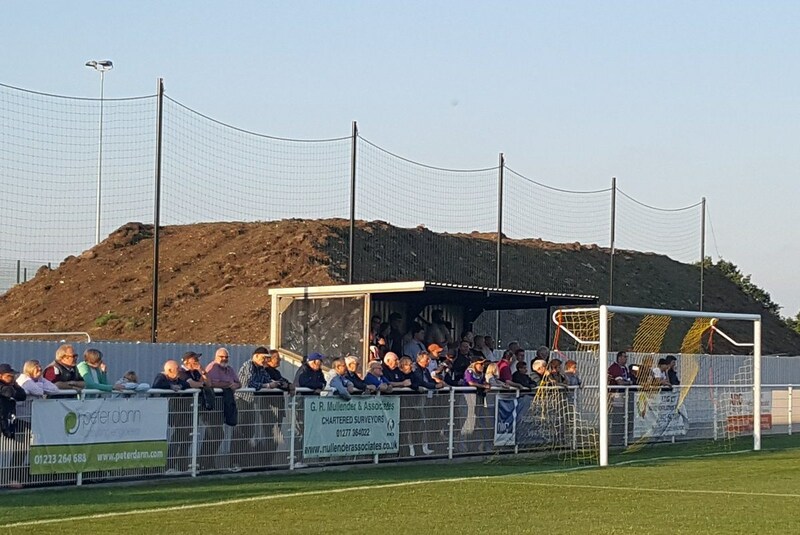 Elsewhere it was the annual Stan Veness Cup at Chadfields where Tilbury played local rival's Grays Athletic. 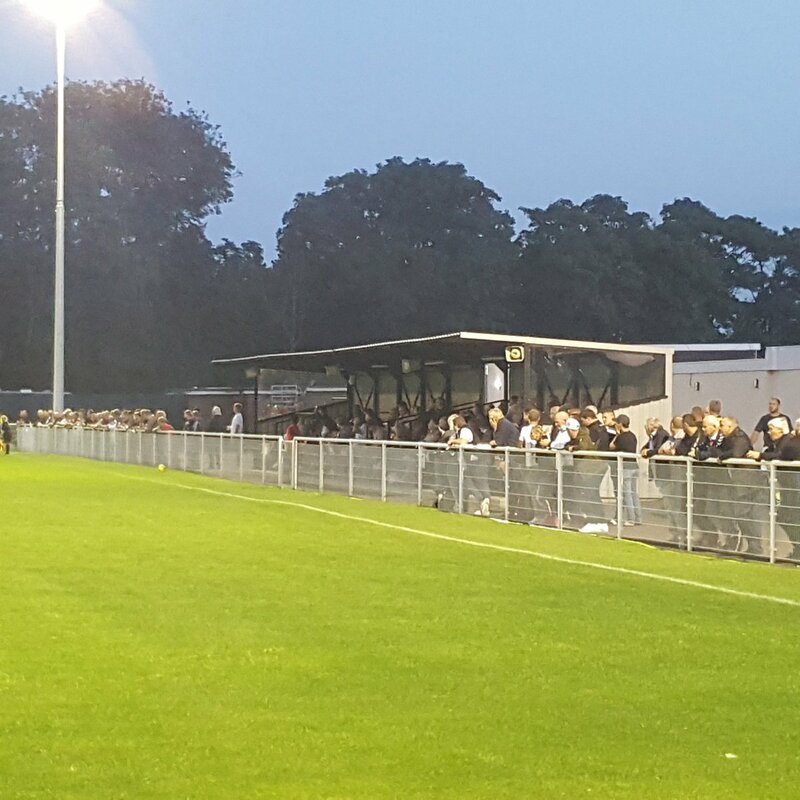 A huge crowd of 560 people saw Grays pick up a 0-2 victory with both clubs raising £2000 for the family of ex Tilbury player Kevin Malthouse who was tragically murdered in early July. The money raised is clear proof that football clubs are not just football clubs but part of the communities they represent. 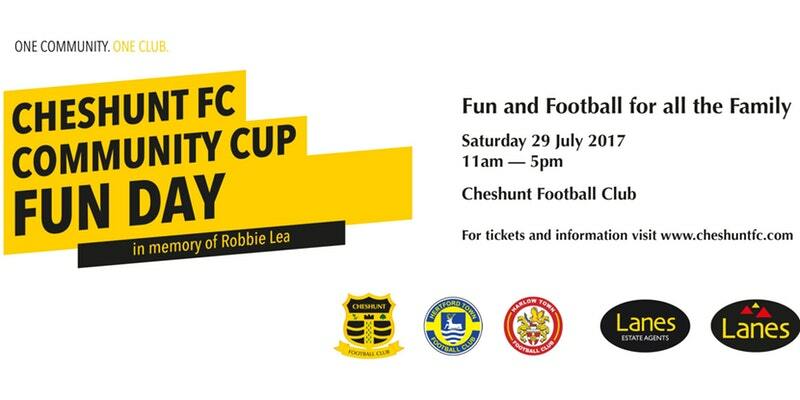 On that point I'll wish good luck to all at Cheshunt FC who host their Community Cup on Saturday which will be played in memory of Robbie Lea, a local boy who sadly drowned in Lea Valley Park recently. The day will promote water safety and 50% of the profits will be donated to fund an awareness campaign to educate people with regards to the dangers of swimming in open water. There will be three 60 minute games featuring Cheshunt, Hertford Town and Harlow Town as well as the Spurs Ladies team in an open training session, A mascot penalty shoot-out, A football freestyler, A speed cage, A 3G football zone, Beat the goalie, Merchandise sales, A Raffle, A DJ with food and drink available throughout the day. If you are in the area it's well worth paying them a visit on Saturday.